I had my first Belgian dish in this restaurant, on my first night ever in Belgium. This restaurant was recommended by owners of the hostel I was staying in, both of them were locals. I came in on a Thursday night and there was no wait as there were many empty tables. I was the only foreigner the whole night. Many grandma & grandpa came to this restaurant and looked like everyone knew each other! The waiter was very friendly. Recommended me a few Belgian dishes and I went for the "Witloof" which was chicory root or endives cooked with ham and cheese and served with mashed potatoes. It was reasonably priced at €15.90. I was surprised that the portion was huge! This dish tasted good and was very cheesy. Would recommend for those looking for a restaurant frequented by locals. 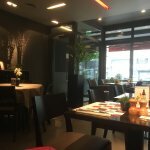 This was our first restaurant in our short time in Antwerp and it was such a welcoming experience. Our waiter was so kind and patient with us. They didn't have an English menu but he was so helpful with explaining everything. When my sister ordered the trout he even helped her with removing the bone. Then he helped us look at the map to find some things to do in the city! We were impressed with how much the staff went out of their way, very kindly to help us have a great experience! Delicious. English-speaking manager and manageress were very helpful. The restaurant is in a rather "ethnic" part of the city Turnhoutsebaan 73, a bit run-down, but Reuzenhof is clean and respectable. Been to Reuzenhof? Share your experiences!